When managing a project, not just software projects, the manager must make decisions regarding the expenditure of limited resources to meet unlimited needs. This is part of micro-economics. 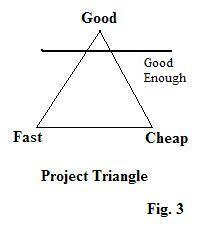 The project Triangle is one good tool to help with the decision making. Any IT guy will tell you that you can do a project Fast, Cheap, or Good, but not all three. 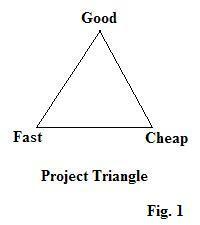 The Project Triangle (see Figure 1) represents this. Notice that the three concepts are placed on the points of the triangle. As you move closer to one concept, you move further from the others. For example, as you move closer to Cheap, you move further away from Fast and Good. Some managers believe that by bullying they can somehow get all three. This doesn?t work. No amount of immature, baby-tantrum-like pushing can change reality in such a way that you can move toward all three points of a triangle at the same time, not in our four dimensions of space-time. There is a chart for this too. The Competency Chart (see Figure 2) shows where these types of irrational demands fit in the scheme of things. A manager who says, ?Let?s break this project down into separate parts and then decide the priority of the individual parts as needed,? ranks fairly high up in competence. 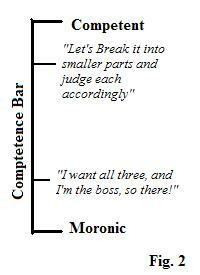 (Note that the manager then has to follow through on this to maintain the competence rating.) In contrast, the manager who wants all three is a moron and should be reassigned to Infantry in someone else?s army. Once you have established that you can?t have everything, the next step is to determine what you really need. Define not just Good, but Good Enough. This is the absolute least amount of Good you have to have to meet the needs, not wants, of the project?s stake holders. The same applies to Fast Enough and Cheap Enough (see Figure 3). These decisions help keep things realistic and help the manager communicate to his or her team what the priorities are. I recommend that you print out the Project Triangle and the Competency Chart and post them some place where they can be a reminder to you and those with whom you work. In this way, you will keep things in perspective and prevent looking like a moron when you suddenly feel like you want all three.